W. W. Norton & Company, 9780393070132, 1152pp. "So I said I am Ezra / and the wind whipped my throat / gaming for the sounds of my voice. . . ." So begins one of the most remarkable oeuvres in the history of American poetry. 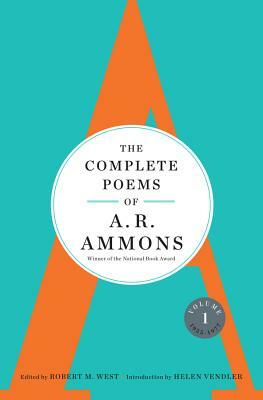 The Complete Poems of A. R. Ammons, Volume I presents the first half of Archie Randolph Ammons's long career, including the complete texts of his three book-length poems from that period: the verse diary Tape for the Turn of the Year, the Bollingen Prize-winning Sphere: The Form of a Motion, and the daring kaleidoscope of The Snow Poems, which late in life Ammons said of all his long poems was his favorite. Here are many of Ammons's most widely celebrated lyrics and meditations, including "Corsons Inlet," "Still," "Gravelly Run," and "The City Limits." Others are more directly inspired by his roots in the rural south, among them "Nelly Myers," "Silver," and "Mule Song." Here too are conversations with mountains (as in "Classic" and "Mountain Talk") and exchanges with the wind ("The Wide Land" and "Mansion"), materialist explanations of reality ("Mechanism" and "Catalyst") and prayers (such as the several poems titled "Hymn"). A poet drawn to theorizing about poetry, Ammons offers both sophisticated discussions of the art (as in "Poetics" and "Essay on Poetics") and disarming assurance: "I believe in fun." The text of each poem has been established after careful consideration of Ammons's manuscripts and other prepublication materials. Endnotes detail the poems' composition and publication histories, and also helpfully annotate references made within the poems. This volume confirms Richard Howard's judgment: "Here was a great poet, surely one of the largest to speak among us."